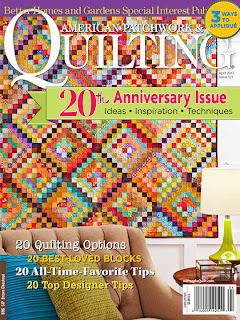 American Patchwork and Quilting’s 20th Anniversary Issue. quilt was chosen for the cover, I literally cried. Not very many people have seen me speechless and crying at the same time. is a followup quilt to……..
from the October 2010 issue of APQ. SIDE NOTE: I would like to announce that since my granny square quilt, I have actually learned to crochet. I have made my fair share of scarves, but I guess I just prefer fabric over yarn. This quilt started out as a color exercise for me. I wanted to see if I could mix Kate Spain fabrics with Kansas Troubles fabrics. How would Barbara Brackman play with Me & My Sister? Can polka dots and reproduction fabrics peacefully co exist in the same quilt? What is the difference between modern and traditional? Could it be classic? My only color rule was to make the center diagonal row of each block the darkest. This color choice was relative once I started putting the blocks together adding pops of texture and shading throughout the quilt. I sliced a piece from many layer cakes as a collected “scraps” for this quilt. It was so much fun. Many nights I didn’t want to stop sewing so I could see how the next block of colors would stitch together. Just imagine how many skeins of yarn I would have to buy to crochet something like this. I hope you enjoy this quilt as much as I did making it. American Patchwork and Quilting as they celebrate their 20th Anniversary. Congratulations Lissa! You were way ahead of the scrappy trip curve — this is a gorgeous quilt! So wonderful, your quilts are just beautiful!! It's just beautiful! Congratulations! I'll be checking my mailbox daily for this issue! It's beautiful! I loved your other cover quilt too and plan to make that someday. Congratulations! I am pretty speechless too! Gorgeous! Congratulations, I cannot imagine how thrilled you must be! Way to go Lissa! WAHOO! What an honor! Your quilts are just beautiful! And, I love that your son left a comment! That is so special! Well if Grant's comment isn't the sweetest thing! Modalissason? When is that book you are writing on raising sons coming out? I could use it. Somebody once told me good things happen to good people. And you are the best. So, SO happy for you my friend!! Lissa, that is wonderful news. You truly deserve it. The quilt is magnificent and I love the combinations of all the collections from modern to traditional to make this scrappy quilt a masterpiece. My copy came in the mail today. Congratulations on being the cover girl! Beautiful, and absolutely deserved. Couldn't have happened to a sweeter person. Oh, I so hope my APQ is in the mail today! And while it may have made you cry when you found out your quilt was on the cover, your son's comment almost made ME cry! You can feel good about all sorts of things—congrats! I was thrilled to find Bonnie Hunter's Scrappy Trips Around the World on APQ's cover; and then shocked to find she was not given proper credit. I hope, at the very least, a correction and apology will be issued. You would have to live under a rock to not realize that Bonnie's pattern has been free on her site for over ten years and is currently rocking the quilt world for the second or third time. Congrats!!!!!!!!!! I'll be looking for it. Congratulations–what a beautiful quilt! And what a huge accomplishment, having a cover quilt on APQ. I'll be making a special point of buying this issue because I love to see different approaches to a traditional, well-known pattern. congratulations, that's such an honour! Well deserved, it is a stunning quilt! I got my issue in the mail today. I always love your quilts! This one is no exception! OMG – this is so awesome! I still have the granny square quilt on my "TO DO" list……Congratulations! Congrats Lissa!!! It is a beautiful quilt!! I love BOTH of the quilts. The first cover quilt has been on my to do list for forever!! wow! Who'd have thought all of those would go together?!? It looks so great! And congratulations! Another one disappointed in the lack of credit for Bonnie's original design. I am saddened that such a kind and giving designer such as Bonnie has been disrespected in such a way. I hope an apology and proper credit is forthcoming. After reading your blog for a long time, I expected more from you. Congratulations! Your cover quilt is amazing, just perfect for the 20th Anniversary edition, I could not be happier for your. Congrats, Lisa! Great work! I remember seeing the 2010 one on the cover also. I'm proud to know you and what a lovely person you are to boot! Congratulations! Wow! So excited for you. I know what this means for you,and you deserve it! Sure looks like Bonnie's Scrappy Trips to me too! It's been all over blogland of late. Such a shame. I opened my magazine today and gasped. It's gorgeous! The beauty of quilting (or any creative endeavor) is that we can take a block, design, pattern, etc., and make it unique by giving it our own spin. Whether we change the technique, the fabrics, the setting, or whatever, it becomes unique to us. Neither Bonnie nor Lissa designed the very first Trip Around the World quilt. They've both approached the making of the quilt in different ways with different fabrics, and they are both beautiful. The quilting world should be thrilled to have such talented ladies that we can learn from. It's a gorgeous quilt. Congratulations and a Texas-sized WOOHOO to you! 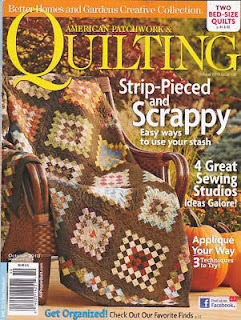 Your quilt is spectacular and the honor of being a cover girl is well-deserved! Nobody uses color and mixes fabrics with as much style, bravado and success as you do. Nobody. I love that you took such a well-known traditional pattern and put a cool, funky, modern spin on it. Well done. I think this brings the count of "Moda Lissa Quilts I Want To Make" to 17. Gee thanks. Seriously… the work you make for me. Congratulations on the cover – and the wonderfulness of your quilt. Oh, Lissa, it's stunning. I was thrilled when I received my issue this week. Laurie B. – well said. Just got our shop copies in today – woo hoo! 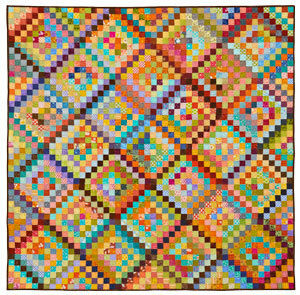 Total agreement with Laurie B….and for those out there who are familiar with 'both' quilts…you'll agree… the look is 'similiar' BUT totally different 'construction' techniques – as well as the use of fabrics…afterall…isn't that what quilting is all about? We ALL put our own 'spin' on blocks and patterns that have been around long before any of us were even a twinkle in our great great GREAT grandmother's eyes! Congrats on your cover quilts! They're both gorgeous! For those who are concerned about this being a copy of Bonnie's pattern, it's actually a different design with different construction. Sometimes things just hit right and we all get excited about them at the same time! It's a beautiful quilt. That quilt is the coolest quilt ever! I'm working on my own with fabrics I love; now I'm wondering if some of my ugly scraps could become a beautiful quilt too. Congrats on the cover!! I **really** don't like it. Not one bit. Lissa, I am a big crocheter too and now a quilter. I see that many of my designs in my afghans are very quilt like. I often look at a quilt and they crochet an afghan with a similar design. I like big blocks and geometric shapes in my quilts. Congratulations on the cover. It is amazing. I'm late to comment, I know, but I love this, can't wait to make it. It is a very traditional pattern which can be made in several different ways. After trying one block I love your method. I am so glad your quilt was on the cover and any controversy is ridiculous!